Trust your local service experts. What originally began as a one truck operation, our company has grown into one of the most reputed residential and commercial service providers of plumbing, heating, and air conditioning in the Hudson Valley. For over 20 years, we have been providing the area with outstanding service, conscientious technicians, timely response, and quality-guaranteed repairs. It has been our belief that if you offer customers dependable, friendly service, they will keep coming back…and they have. A plumbing company Overflowing with Service™. That has been the cornerstone of T.Webber Plumbing, Heating, Air & Electric since 1987, its very first year in business. As your trusted plumber in Poughkeepsie NY we have always offered the installation, repair, and replacement of faucets, sinks, toilets, showers, tubs, disposers and dishwashers for homeowner and business owner alike, we do so much more. We strive to make our customers’ lives simpler by handling all of their plumbing and heating needs with communication, courtesy and convenience. T.Webber has been providing expert service throughout the Hudson Valley, including: Dutchess, Putnam, Westchester, Orange & Ulster County for over 20 years. 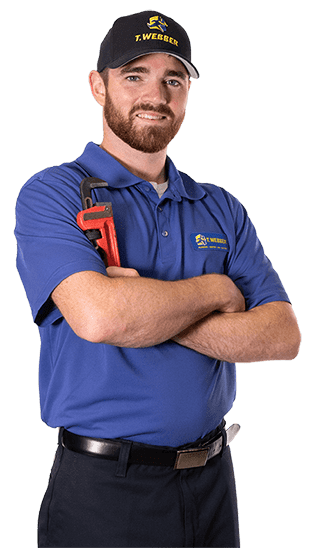 Plumbing: When a plumbing emergency strikes, count on the expert team of plumbers in Poughkeepsie NY at T.Webber Plumbing, Heating, Air & Electric to fix your system and get your life back to normal as soon as possible. Drain Cleaning: Our highly trained and experienced professionals will arrive at your doorstep in a timely manner and take care of all your drain problems. We only use the latest and highest quality drain cleaning tools in your home to ensure you are 100% satisfied with your results and keep your drains working properly for many years to come. Well Pumps: T.Webber is your source for any service needed for well pumps and well tanks. Our technicians are well-certified and are ready to diagnose and resolve any issue your system may be facing. Heating: Like any other appliance in your home, furnaces that have been around for a few years will eventually need repairs. No home appliance can maintain peak performance without a professional tune-up every now and then. But fortunately for our customers, we have an expert team here at T.Webber ready to help you fix any furnace problem you run across. Cooling: Air conditioning problems won’t always wait until it’s a convenient time for you, so at T.Webber Plumbing, Heating, Air & Electric we make sure any time is convenient for us. We always respond quickly to an emergency cooling call, and will get your air conditioning system working again in no time so you and your family can get back to living life normally. Water Filtration: Clean water is crucial to healthy living, so do it the easy, cost-efficient way and get a water filtration system installed in your home by an expert plumber in Poughkeepsie NY. Surpass the expectations of our clients and work hard to be the best plumber in Poughkeepsie NY and the surrounding area. As well as the company of choice in our industry. Service our customers with integrity, competence and objectivity. Deliver to our customers all that we promised through value-added services. Perform our work to meet all technical codes. Explore each customer’s situation to sufficient detail and gather enough facts to gain an understanding of the problems, how much assistance is needed, and the benefits our services will provide. Respect our customers’ home and property and leave them just as clean as we found them. For all of your plumbing, heating, and cooling needs, look no further than T.Webber. Call us today! We will come out when it’s convenient for you. You will know the cost before we begin working. Our skilled techs love their jobs and it shows. Let us show you why so many people trust us. We hold all our work to the highest standards. Our work isn’t over until you are completely satisfied. My House is Warm Again! Get instant access to over $500 in coupon deals.